The beFree sound home entertainment speaker system puts high-performance sound for music and movies well within reach. This system brings amazing sound to your stereo or home theater components. This 5.1 surround sound system blends easily with your décor, making it an excellent choice for smaller rooms. Innovative technologies let you hear new details and nuances even in your most-played favorites. 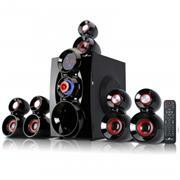 The system's five speakers deliver vivid and lifelike music and movie performance. Just three inches, these small speakers faithfully reproduce the clarity and natural sound of a live performance.